BEIJING, Feb. 2 (Xinhua) -- Russian, Indian and Chinese foreign ministers issued a joint communique Monday after wrapping up their 13th meeting in Beijing. 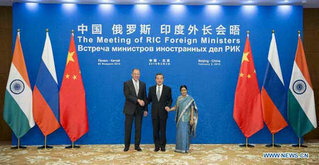 The Foreign Ministers of Russia, India and China have held their 13th Meeting in Beijing. They've briefed the press and issued a joint communique. They emphasized that cooperation is conducive to maintaining international and regional peace and stability and promoting global economic growth and prosperity. Further strengthening coordination on global issues and practical cooperation. Foreign Minister Wang Yi talked with Russian Foreign Minister Sergei Lavrov and Indian External Affairs Minister Sushma Swaraj. They released a joint communique, saying their three countries should enhance cooperation in think-tanks, business, agriculture, disaster mitigation and relief, medical services and public health. The Ministers also explored potential for cooperation in oil and natural gas production and transportation, as well as in other fields of energy, high tech, environmental protection and connectivity. They agreed to promote parliamentary, media, cultural and youth exchanges including visits of young diplomats. China's Wang Yi spoke extensively about the strong basis and motivation for cooperation. "China, Russia and India are all major countries in the world; we are all emerging market economies. We are committed to the independent policy of peace, and the path of peaceful development. We will inject more positive energy to the outside world, and we will work to make the world safer and more stable. Our three countries join together for closer, mutually beneficial cooperation and common development. This will directly benefit over the forty percent of the world population," Wang said. The Ministers noted that 2015 marks the 70th anniversary of the founding of the United Nations and the victory in the Second World War, and paid tribute to all those who fought against Fascism and for freedom. Sergei Lavrov shared his view on regional security. They say they're determined to build a more just, fair and stable international political and economic order in accordance with the purposes and principles of the UN Charter, the Five Principles of Peaceful Co-Existence and other basic norms of international law. "We have had very constructive discussion covering cooperation in various mutilateral mechanism, including G20 and BRICS. I would like to convey my appreciation to my counterparts for the support for India's membership in the Shanghai Cooperation Organization after completing all necessary negotiations and legal processes," Sushma Swaraj said.